PRO SERIES Double-brace "X" with height, tilt, angle & depth adjustable second tier. The absolute hands down choice of most professional musicians because of its adjustability, strength and reliability. The QL742 ProSeries Stand features the new Quik Lok "Push to adjust" locking disc system with user-friendly push button and super heavy duty 30 mm x 30 mm steel tube bracing for extra sturdiness and structural support. The second tier set is fully adjustable in height, angle, tilt and depth, and offers the musician maximum flexibility of use. 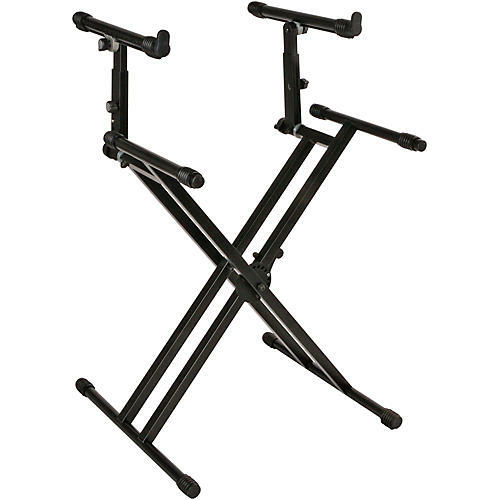 The "Pro Series" stands are capable of holding the heaviest keyboards safely and securely. A complete line of accessories allows the user to customize the QL742 to fit their needs perfectly. Order now and support your equipment safely.